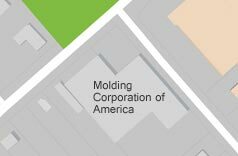 Molding Corporation of America (MCA) is a full-service custom injection molder providing high quality plastic parts, sub-assemblies, finished products and a diversity of rapid manufacturing solutions. Established in 1964, MCA has grown into one of the region’s leading molders with 25 injection molding machines at its 65,000 sq. ft. Pacoima, California facility. MCA serves all markets; aerospace, consumer, healthcare, automotive, telecomm, electronics, furniture, sports, recreation and others. In-house moldmaking: New molds / mold repairs / existing molds service. Full Service Injection Molding: Product Manufacturing. Complete Engineering Services: Design, Drawings, Prototyping. Insert molding: Plastic over metal. Engineered materials: For critical, demanding applications. Machine sizes: 40 ton to 880 ton and conventional & shuttle presses. Highly trained staff: State-of-the-art equipment. Decorating: Hot stamping, pad printing, and painting. Secondary operations: Annealing to ultrasonic welding. Part Design: Do's and dont's of part design. Glossary: Plastic injection molding definitions. FAQ: Common questions we receive.